Contains the World’s Most Powerful All Natural Chelating Agents! Vegamatris Grow is formulated using the Earth’s most powerful All-Natural chelating agents. These chelating agents guarantee that your plant is getting the maximum amount of Nitrogen, Phosporous and Potassium necessary to increase your plants biomass. Bigger biomass means massive harvests. Grow is formulated to be a source of primary nutrients, combining Grow with Vegamatrix Bloom will enhance its effectiveness. Different ratios of Grow, Bloom and Boost can be used to grow an extremely wide variety of plants, including ornamentals, vegetables, trees, shrubs and medicinal crops. The combination of our natural veganic ingredients makes it almost non-burning even at extremely high doses. Combining sophisticated chemistry with processes like homogenization and fermentation we’ve created this superior VEGANIC plant nutrient. 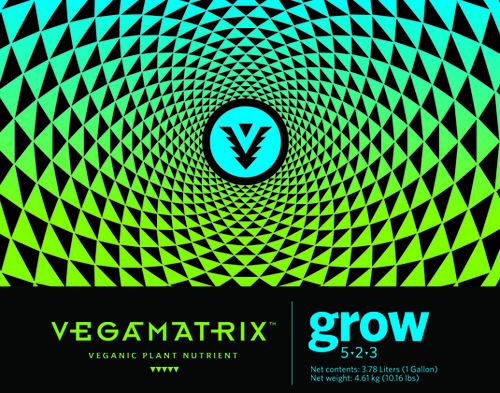 Vegamatrix Grow is derived from over 95% natural ingredients. Clean crops are essential to people and our planet. Extensive testing created this blend of organic materials, naturally mined minerals, and just a touch of synthetic minerals to provide explosive growth. Grow vigorous plants without sacrifice to the earth. We have combined all the vital ingredients for full flavored produce in 3 bottles. Veganics made easy!